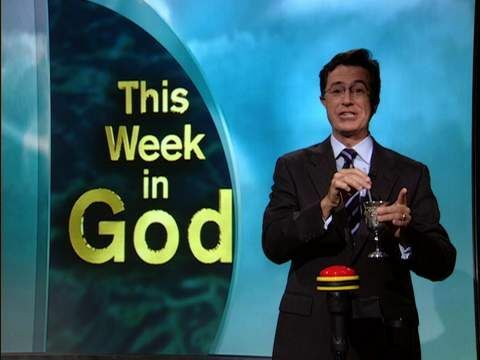 Stephen Colbert is a fake ideologue host, but he is also a sunday school teacher (in real life! )…and on occasion, it shows! On tonight’s show (3/18/2010), he talked about Glenn Beck’s social justice miseducation, and interviewed a Catholic priest, holding his own on theological and biblical notions. Comedy and solid theology gold! But while interviewing Mary Matalin, Matalin said that Jesus said something like “if you give a man a fish, you feed him for a day.” She also said Jesus said “if you are lazy, you don’t eat.” I apologize that I don’t have the exact quote word-for-word. 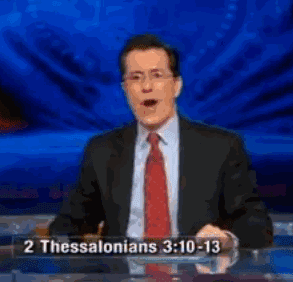 But Colbert countered that Jesus didn’t say either of those. The interview meandered on and the show was over. Then it got weird. At the last minute of the show, the words “2 Thessalonians 3:10-13” flashed on the screen. Did anyone else see it? What is it? For even when we were with you, we gave you this command: Anyone unwilling to work should not eat. For we hear that some of you are living in idleness, mere busybodies, not doing any work. Now such persons we command and exhort in the Lord Jesus Christ to do their work quietly and to earn their own living. Brothers and sisters, do not be weary in doing what is right. So it would seem to indicate that Matalin was correct…such admonitions against laziness are in the Bible. But Jesus did not say it, and even 2 Thessalonians is not likely to have been written by Paul, instead representing what John Dominic Crossan calls “the Conservative Paul” who makes other statements contradictory to the other letters of Paul, especially on social issues like poverty and women (more here). Authorship is important in biblical study, people! So, in short, +2 to Colbert for knowing what Jesus said…but -1 for the show’s editors muddying the issue by linking Jesus with 2 Thessalonians. I will link the video clip tomorrow when it comes online. Actually, this scripture doesn't support her statement "if you don't work you don't eat". It says if you are "unwilling to work" you shouldn't eat. While there are some who MAINTAIN poverty, most who would be classed as poor are hard-working, or UNABLE to get work that would be able to pull them out of poverty. They are certainly NOT "unwilling to work". These poor are doing the best they can with what they have. So this doesn't muddy the waters, it clarifies the truth. LAZINESS should result in lack of food, but equating poverty with laziness is wrong and is not what this scripture is saying at all. The sad truth is that in the system we live in, laziness is often rewarded, where the people who do the REALLY necessary jobs (maintenance, cleaning, clerical, teaching) are paid next to nothing and treated like dirt. I don't get the Thessalonians quote either but did think that Mary Matalin made herself look pretty foolish by saying Jesus said, "If you give a man a fish …" The quote she's thinking of—give a man a fish, feed him for a day; teach a man to fish, feed him for a lifetime—is Confucius. If Jesus felt that way the miracle of fish and loaves wouldn't have happened. She was an adviser for Cheney though so it kind of makes sense how wrong she was. If you're going to say that someone looks foolish for misattributing a quote, you should make sure you don't make the same mistake. The "give a man a fish" line did not come from Confucius. It's often vaguely described as a "Chinese proverb," but even that's dubious. Look up the origin of "A picture is worth a thousand words." I think that protestations against social justice (by Beck and company) are silly. But I don't think we have to deconstruct 2 Thessalonians to say so. I just think we have to read it in context, as we should with the rest of the Bible for that matter. I was stunned by her fumbling when he raised the faith issue as well. She clearly was not expecting to be asked to connect her political and her religious views. My facebook friends are reminding me that disputing the canonicity of 2 Thess and authorship perhaps isn't as persuasive as delving into the scriptural meaning in context, as you and the facebookers have. Thanks for the reminder to reign in my heavy-handedness at times, folks! I found it interesting that Matalin interpreted the "give a man a fish" maxim to mean "you don't work, you don't eat." Since the maxim ends "teach a man to fish and he eats for a lifetime," it actually exhorts us to educate the poor to get them out of their trap! Watching Matalin, I was reminded of another quote: "Work makes one free," but couldn't remember what I knew was its negative origin, so I looked it up. It was found on the sign at the entrance to Auschwitz. Ironic, since Obama is constantly being called a fascist by the loudest elements of the right-wing (also ironic is that in the same breath they call him a socialist and sometimes a communist, the opposite ends of the political spectrum). While searching, I found another quote: "We need to steer clear of this poverty of ambition, where people want to drive fancy cars and wear nice clothes and live in nice apartments but don't want to work hard to accomplish these things. Everyone should try to realize their full potential." This one is from Barack Obama! I am an independent and don't want to politicize this discussion, but just want to point out how twisted the arguments are that are being made against ANY and ALL efforts to fix the worst effects of poverty in this country by those who ARE trying to politicize everything, for what I consider to be their own, very cynical, power-seeking ends. Well said. I real love Colbert he real shut Mary Matalin down. I real felt she real did not know the scripture she was referring to (her fumbling gave her away), no real surprise there, even though she is very good at her day job. Let’s face it, she is very smart so if she real knew the subject she would have hit this with a response “out of the park”. Instead, she said very little. Too funny.